Providing various public transportation options to the Cape Fear area residents, Wave Transit has been a staple on the Wilmington roads for many years. Through a new initiative called Wave Connect, The Cape Fear Public Transportation Authority-Wave Transit is aiming to make public transportation known and accessible to everyone, including individuals with physical or cognitive disabilities. Wave Connect is way for Cape Fear Public Transportation Authority-Wave Transit to eliminate any obstacles or stigmas associated with public transportation. Wave Transit wants to make travel training free to anyone who needs it, including individuals with physical or cognitive disabilities. In addition, UNCW students will still be able to ride the bus system for free. Group Travel Training sessions will be provided as well, providing information on how to read city maps, the boarding process, finding your route, and steps to take in order to reach your destination through the public transportation system. Our team with Sage was challenged with designing a logo for the new Wave Connect initiative that fully portrays the mission of the system to the Cape Fear community. In addition to designing a new logo, we were also challenges with creating informational marketing materials to inform the public about the new transit system. Our graphic design team created a brand new logo for Wave Connect, that displayed the different aspects of its vision. The four circles at the top represent the Travel Training programs, the bus and van travel options, and reaching out to the entire community. The wave symbol and font remained the same as the Wave Transit logo and the word “Connect” was added, with a slogan to better enforce the purpose of the initiative. 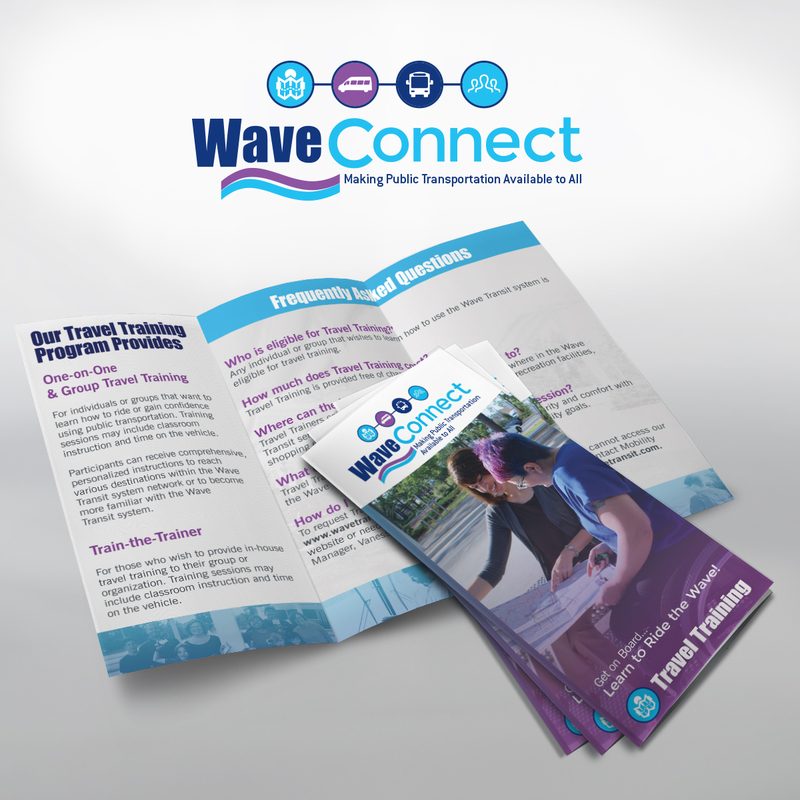 Our design and copywriting teams also worked together to design and write a Travel Training brochure that explains the mission of Wave Connect. And stay tuned! Sage Island is currently in the process of designing a new website for Wave Transit, which will also highlight the benefits of Wave Connect for our community. Learn more about the incredible impact that Wave Connect will make on our community, and be sure to catch a Wave soon to get to your next destination!